Citation Information: J Clin Invest. 2011;121(9):3467-3478. https://doi.org/10.1172/JCI43737. Hirschsprung (HSCR) disease is a complex genetic disorder attributed to a failure of the enteric neural crest cells (ENCCs) to form ganglia in the hindgut. Hedgehog and Notch are implicated in mediating proliferation and differentiation of ENCCs. Nevertheless, how these signaling molecules may interact to mediate gut colonization by ENCCs and contribute to a primary etiology for HSCR are not known. Here, we report our pathway-based epistasis analysis of data generated by a genome-wide association study on HSCR disease, which indicates that specific genotype constellations of Patched (PTCH1) (which encodes a receptor for Hedgehog) and delta-like 3 (DLL3) (which encodes a receptor for Notch) SNPs confer higher risk to HSCR. 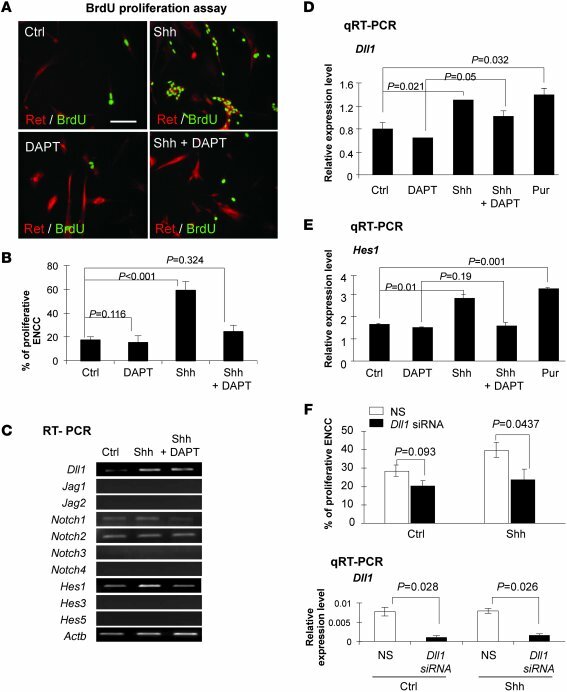 Importantly, deletion of Ptch1 in mouse ENCCs induced robust Dll1 expression and activation of the Notch pathway, leading to premature gliogenesis and reduction of ENCC progenitors in mutant bowels. Dll1 integrated Hedgehog and Notch pathways to coordinate neuronal and glial cell differentiation during enteric nervous system development. In addition, Hedgehog-mediated gliogenesis was found to be highly conserved, such that Hedgehog was consistently able to promote gliogenesis of human neural crest–related precursors. Collectively, we defined PTCH1 and DLL3 as HSCR susceptibility genes and suggest that Hedgehog/Notch-induced premature gliogenesis may represent a new disease mechanism for HSCR. Shh upregulates Dll1 expression to mediate proliferation of ENCCs. (A) BrdU proliferation assay showed that Shh (3 days) significantly (P < 0.001) increases the proliferation of ENCC progenitors (BrdU+/Ret+). This effect could be counteracted by treatments with DAPT (10 mM). Scale bar: 100 μm. Ctrl, control. (B) Proliferating Ret-expressing cells that incorporated with BrdU (for 16 hours) were counted. The values reported in bar charts represent the mean ± SEM, and 3 independent experiments were performed. Data were analyzed by 1-way ANOVA, followed by the Tukey post-hoc test. P values of less than 0.05 are statistically different from those of the control. (C) Semiquantitative RT-PCR for the Notch pathway genes after treatment with Shh in presence or absence of the Notch inhibitor DAPT (10 mM) (3 days). (D and E) Quantitative RT-PCR (qRT-PCR) for the expression of Dll1 and Hes1 in ENCCs treated with Shh, Shh plus DAPT, and Hh agonist, purmorphamine (Pur, 1 mM) (3 days). (F) Knockdown of Dll1 significantly abrogated the Shh-mediated proliferation (3 days). Quantitative RT-PCR for the expression of Dll1 shows that siRNA can significantly downregulate Dll1 expression (3 days). Nonsilencing RNA (NS) was used as a negative control. Bars represent the mean ± SEM, and 3 independent experiments were performed, each in triplicate. P values of less than 0.05 were considered to be statistically significant.